The Copenhagen conference is upon us, and what's happening ? Well, CO2 emissions from delegates travelling to the conference are huge for a start, so let's hope they achieve something. No doubt we've also got any number of articles about "the world's cycling capital" to look forward to. So what's the problem with this ? You can see why there is this concern over safety in almost any photo of cyclists in the city. The majority of cycle paths have no real separation from the street. To cycle in Copenhagen is to cycle in close proximity to motor vehicles. This leads inevitably to a lower level of subjective safety. The paths are also very narrow. Many are just two or 2.2 metres wide. This is much narrower than the 2.5 m + 1.5 m separation from the road which is normal in the Netherlands for single direction paths. A recent report from the Fietsberaad reported that there is "no promotion" and "almost no important technical or infrastructural innovation." The cyclists of Copenhagen include relatively few children. Helmets are much more common than here in the Netherlands (they reflect the feeling of safety of those who choose to wear them). There are lots of motor vehicles. When the Copenhagenize blog includes a piece on cycling to school, you don't see videos of Danish children. Rather, the blog has used the video I shot of Dutch children here in Assen. That's great, but where are the Danish children ? This is important. I can see the next generation of Dutch cyclists already riding their bikes, but not where the next generation of Danish cyclists will come from. Danish children cycle to school less than ever. Lots of people do use cargo bikes to transport their children within cities, but children are relatively infrequently seen on their own bikes. To be fair, Copenhagen is trying to do something about this, and Mikael is right to point out the absurd direction in which cycle promotion has been heading in Denmark. But the cycling rate in the country as a whole has dropped 30% since 1990. (Sadly, it continues to drop). So how much cycling is there in Copenhagen ? The diagram above comes from page ten of "Cycle Policy 2002-2012", an document produced by the City of Copenhagen, showing the modal shares for the city. The text says "The (bicycle) share of the total number of all purpose trips is slightly less than one fifth, but the share of home-workplace traffic is as high as one third." Note how the figure for commuters is substantially higher than that for all trips. This is very often the case because when you concentrate on commuters you conveniently get to ignore the problems faced by pensioners, disabled people, parents cycling with their children and children cycling on their own. Working age adults are less sensitive to a low level of subjective safety. These figures come from ten years ago. Why am I looking at such old figures ? Well, as it turns out, newer figures from a reliable source are not that easy to find. More recent "Bicycle Accounts" omit the "all trips" figures and only talk about the more impressive figures for commuting. According to the "Bicycle Account" for 2008, the commuting figure has risen to 37%. If we scale the "all journeys" figures by the same proportion you can expect that around 22% of all journeys in Copenhagen are now by bicycle - and around twice that number are by car. John Pucher independently reports that "A 2005 travel survey found that 20% of all trips in Copenhagen were by bike." (page 26 of this document). Do I have something against the Danes ? I am sure that some people will ask my motivation for posting this. Do I have something against the Danes ? Of course not. Denmark has the second highest cycling rate in Europe. That is something to be proud of, and to build on. I want to see them reach their target for 40% of commuters by bike. I'd like to see them set targets for wider demographics than just commuters, too. Denmark needs to try harder than they are at present, for the sake of their own cyclists quite apart from for the rest of us. Copenhagen looks impressive compared with countries where few people cycle, but the cycling rate is not that high in comparison with many cities in the Netherlands. Several Dutch cities now have more cycle journeys than car journeys. However, while Copenhageners also like their bikes, they still drive a lot more than they cycle. I think it's quite simple. The infrastructure has let them down. Cycling in Copenhagen isn't as stress free as it needs to be. Not quite so pleasant as it needs to be. There is inadequate subjective safety. Dutch cities with less than a 30% share are considered to be doing quite badly and work to make improvements. At 27% of all journeys, and 35% of all journeys under 7.5 km, the cycling modal share for this entire country is higher than that of Copenhagen. 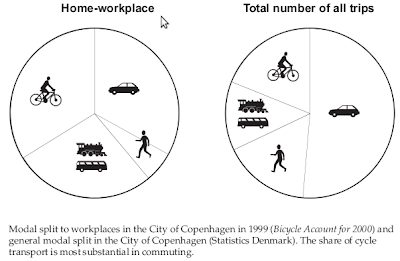 The proportion of people cycling to workplaces in Copenhagen shall increase from 34% to 40%. Cyclist risk of serious injury or death shall decrease by 50%. The proportion of Copenhagen cyclists who feel safe cycling in town shall increase from 57% to 80%. Cyclist travelling speed on trips of over 5 km shall increase by 10%. Cyclist comfort shall be improved so that cycle track surfaces deemed unsatisfactory shall not exceed 5%. The 40% commuting target has not yet been met. Rather, the city still says that "more than a third of residents pedal their way to work." The fears associated with cycling in Copenhagen have risen. The proportion who feel safe has dropped from 57% to 53%. Actual death and injury rates have definitely dropped, which is very good news. The other two issues, of speed and comfort have not been reported on, so I can only assume there isn't much progress to report on these. So, why the lack of progress ? It comes down to quality of infrastructure and levels of subjective safety. As shown before, cycling in Copenhagen means cycling in close proximity to cars. Road junctions generally don't separate cyclists from motorists as they do here. The 2008 bicycle account reports that "58% (of Copenhagen cyclists) feel unsafe because of cars." Cycling simply doesn't feel safe enough with Copenhagen's infrastructure and that is why growth has stalled where it has and why the demographics are as they are. How is the infrastructure different ? Some of the language from the Cycle Policy document explains the difference. For example, "Normally cycle tracks are wider than two meters across." Two metres is actually rather narrow by Dutch standards which require 2.5 metre minimum widths. Also, there is no mention of any separation from the road. We have a 1.5 m separation standard here, while on many of the Danish cycle tracks, there is simply a kerb which will drop you onto the road. This makes the usable width of the cycle tracks narrower than their actual width. Copenhagen (urban population 1.8 M) has around 350 km of cycle tracks. This are in large part not separated from the road by more than a kerb. Also, at junctions bicycles and cars are mostly mixed in together without separate traffic light timings (even with their newer designs). There are more details and lots of photos of different types of Copenhagen cycle tracks on page 23 and onwards in this document. By contrast, even tiny Assen (population 65000) has over 100 km of separated cycle paths (double that if you count both sides of the road - I'm not sure how Copenhagen counts), which are mostly quite well separated from the road, and road junctions mostly keep cars and bikes separate (as seen here, here, here). Copenhagen is also growing a network of "green cycle paths" away from the road, and now has more than 25 km of these. From the videos and photos I've seen, these look very good. They quite closely resemble some of the better cycle paths we have in Assen and Groningen. I've recently featured some typical local cycle routes here and here. The reaction of an American visitor to the streets of Groningen can be seen here. So, why write this now ? Copenhagen's marketing as "the world's cycling capital" has been very successful so far. Nice branding too. However, real growth in cycling comes not from marketing and branding, nor from taking photos of pretty girls on bikes, but from investment in infrastructure. Unfortunately, the effects of the hype now go beyond the residents of just that one city. London, for instance, seems to think that merely painting its cycle paths "copenhagen blue" will lead to success. It won't. To get a really high rate of cycling you need the proper infrastructure. There is one country in the world which has it. So what's to be done ? Groningenize ! What is needed everywhere is to build better infrastructure and make cycling more attractive. Copenhagen itself could do with a good dose of "Groningenization" in order to improve both its cycling rate and the demographics of its cyclists. Groningen itself needs to continue to improve its infrastructure in order to continue to increase its cycling rate. And the rest of the world would be best off watching the best example. To "Copenhagenize" is to copy what is second best. "Groningenize", "Netherlandsize", even "Amsterdamize". Copenhagen has achieved a lot. It has the highest cycling rate in Europe outside of the Netherlands. There is quite a lot of catching up to do to get to the point that many Dutch cities have reached, but they're still doing really well by world standards. Let's keep it in perspective, cheer on their success so far. However, it's also important to realise why their success has been limited, and try to understand why Dutch cities have achieved so much more. Other countries wanting to achieve a significant modal share for bicycles really do have to look beyond Copenhagen. Groningen leads the world. And what about Assen where we live ? Well, the cycling rate here is 41% of all journeys. Not as high as Groningen, but not far off double the figure for Copenhagen. It's a very high figure for a city which doesn't have a student population to boost the cycling demographics. This city only started to refer to itself as a "fietsstad" or "cycling city" after the all journeys figure reached 40%, and then did so just with a small piece in Dutch on the city's website. That's called modesty. We weren't born here, but came here for a reason. The cycling environment is first class (not only in the city but also in the countryside) and it's a wonderful place to live. There are several other posts about Copenhagen. Copenhagen has continued to make claims which are not supported by evidence. For instance, a widely reproduced press release which claimed a huge number of cyclists on "the busiest cycle street in the world" did not stand up to scrutiny. You read it here first in 2009, now it's confirmed by the Danish press (English translation). Cycling has stagnated in Copenhagen at about 35% of commuters, well short of both the 40% target which I wrote about above and the 50% target which the city then set. As I suggested in 2009, Copenhagen has at last started to look to Groningen for advice. The Danish article discusses several of the things that we recommend and which feature on our study tours: Simultaneous green junctions, the much larger railway station cycle parking facilities in the Netherlands, and it is topped by a photo of the Gerrit Krol triple bridge which saves cyclists an enormous amount of time. It's also been confirmed this year that two stage junctions used widely in Denmark are an unsafe design of junction which has led to many deaths. These problems could have been avoided or minimised by Copenhagen and Denmark as a whole following a path of building better infrastructure which invited people to cycle rather than relying heavily on marketing, both within the country and to an outside audience. We can help cities in Denmark or any other nation by demonstrating best practice. Five years after publishing this blog post, calling for Denmark to attempt to stop trying merely to use hype to sell cycling and instead "Netherlandsize" itself so that the country can genuinely grow the popularity of riding bicycles, there is at last official recognition within the Danish government that cycling has been in decline for twenty years in their country. This is a very good thing. It is only after recognition of a problem that the beginnings of a solution can be found. Unfortunately, this new found sense didn't last. A few weeks after I wrote the last paragraph, Copenhagen once again started claiming implausible numbers of cyclists on one route as a success. For the sake of your own population, it's time that international city marketing and promotion of prestige projects took second place to building a useful network of infrastructure. in Copenhagen for 2010 and 2012. Car usage rose from 29% to 33%. Independent research shows that cycling continues to decline in Copenhagen. Sadly, the cycling embassy of Denmark reports that funding for cycling has been severely cut. 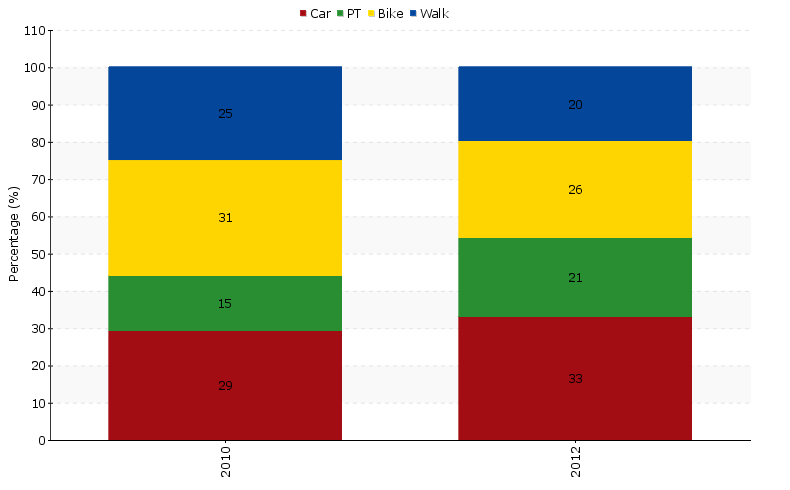 Official figures from the city also show that cycling in Copenhagen declined between 2010 and 2012. This post was inspired by a post on a similar subject on the Amsterdamize blog, and not quite believable figures quoted on the Copenhagenize blog. The Groningen chart comes from page 23 of this presentation by Cor van der Klaauw. Since this blog post was written, the claims on the Copenhagenize blog have been slightly modified. You're undoubtedly right, but the pretty pictures of the girls on bikes have probably done more to bring the attention of the world's cyclists to the benefits of decent bike infrastructure than pretty pictures of bike lanes have... I know I probably would have been stuck on an integrationist/'crap cycle lanes' mode of thinking if I hadn't stumbled upon Copenhagen Cycle Chic first - and through it and Copenhagenize and the like, your own blog. It is funny to read an article saying that 2-2.2m cycle lanes with a curb between them and motor traffic are somehow inadequate compared to 2.5m + 1.5m gap. The first seems excellent, the second seems like overkill, although I cannot fault your comparison betwen NL and CPH. Riding in the UK, I would feel lucky having 1.5m of painted lane. And there is nothing like that in the city I live in, Gloucester. I guess I've been desensitized to traffic to such a degree that only the worst motorist behaviour causes me to take notice. Of course, it does take a fair amount of determination to keep at it until you're used to having cars passing within 1m on a regular basis. And when I think of 2.5+1.5+2.5.1.5=8m of space being set aside for cyclists in the UK's main road streetscapes, the phrase "A cold day in hell" comes to mind. Which is a pity because we need -> 25% - 50% of trips by bicycle if the bicycle is to be more than a bit player in CO2 reduction, so why shouldn't we have 25% - 50% of the road space? Just to say, in Stockholm I noticed that, while in contrast to the UK cycle lanes did not share the tarmac with cars... they were often just subsections of the pavement and put cyclists in competition with pedestrians (or pushed them back out on to the road!). Interesting. I wonder if Mikael will have a comment. the Morocco/Copenhagen summit comparison is off by a factor 1000. It's roughly 44 kilotons for Copenhagen vs. 44 Megatons for Morocco. I mention it because since these kind of comparisons tend to be get stuck. On the main thrust of your argument: while I usually agree with you, I do think you place too much importance on separation of cycling, at least within cities. IMHO, what's important isn’t absolute separation, but the amount and speed of the traffic. The reduction in subjective safely in Copenhagen didn't come from more non-separated bike paths, it most likely came from increased traffic both cycling and cars. That is not to say that wider paths, more separation (especially near crossings) and generally more cycling infrastructure wouldn't be a good thing, but I'd argue that the most important part is to get a basic infrastructure in place in order to reach a critical mass of people cycling. Ben: That's so often the problem with stats from Newspapers. I've removed the misleading text on the link (the article is still worth reading). From what I can see, the quality of infrastructure is directly proportional to the cycling rate. I've covered before how Dutch cities with less good infrastructure have lower cycling rates, and how the ways a city with a low cycling rate intends to increase cycling include further separating cyclists and drivers. I'm firmly of the opinion that it's more difficult to progress from a 20% cycling rate to a 25% cycling rate than it is to get from 1% to 5%. The reason why is that the people you need to convince between 20% and 25% are far more sensitive to subjective safety issues than the easy to convince people are. @Taliesin: I'm sure you would be glad of Copenhagen lanes, but would those blue painted lanes convince parents to let their 10-yo kids ride to school alone? Would grannies bike to the grocery store on them, whilst the cars zoomed right passed them? No. Copenhagen shows that it mainly attracts young people, like yourself, commuting, but even they don't feel quite safe. And that's not good enough. In the land of the blind, one-eye may be king, but he's still a guy who is blind in one eye. Why should this matter? Well, because obviously governments over the world, including the British government, is looking to *Copenhagen* to emulate. Blue paint is cheaper than separted lanes in a comprehensive infrastructure, so they are happy. They get to be cheap and look as if they are doing their best for the cyclists. But it's not about the 'cyclists', it's about people who would cycle if only they thought it safe. Thank you for this very inspiring -and informative- piece of writing. Thanks for shedding new light upon a popular matter. Comming from Copenhagen, i agree with David. We need better bicycle lanes to increase the level who ride. And better parking. Separation does mean a lot for people feeling safe. However, when you compare with Copenhagen, dont use Assen or Grönningen. Compare to a bigger city like Amsterdam or Rotterdam. I'm sure you are right about the importance of a safe, convenient and above all segregated cycling infrastructure to get people cycling. I am pessimistic about the future of cycling in London, where most of the cycling infrastructure has to be shared with drivers, who frequently abuse it. Certainly where I live in outer London cycling doesn't feel safe, and drivers come physically very close. Even recommended cycling routes are being converted to one-way (with no contraflow lane) in order to meet a growing demand for on-street car parking. Cycle lanes on 'A' roads are rarely more than 1.5 metres wide, and that's without taking into account broken glass, puddles and miscellaneous litter. I think for Britain to reverse the national decline in cycling it needs to embrace segregated infrastructure on the Dutch template, of which you keep giving many wonderful examples. I used to be a firm integrationist, just as so many British cycling campaigners still are. But not any more. Integration just isn't working in Britain, no matter how the statistics are spun. I have never been to Copenhagen, but I have friends there. When I showed them the Copenhagen Cycle Chic website shortly after I first discovered it, they each told me that it was a considerable distortion of how the city really is. Since then, I read the blog more as a creative interpretation of the city rather than a documentation of reality. On the other hand, I have been to Amsterdam several times, and I know first hand that the bicycle culture there is exactly as people say it is. I would be curious to see Copenhagen for myself. Excellent article and I fully agree. I have frowned upon many claims I read about Copenhagen in the past few months. Plain general figures are simply not available. As it happens a paper in the Netherlands featured a similar article about these unjust Copenhagen claims on the same day you did. I guess what you are really saying is: beware world, don't copy second best. That Copenhagen is second best is in itself a big achievement but anyone wanting top cycle rates should look at the best example. Your observations are - as usual - unique and accurate. I refer to your remark about the children's cycling rate and your fears for the cycling future of Copenhagen. Spot on! Hadn't read that anywhere else before. Something to be taken seriously. I can understand Copenhagen's motivation in promoting themselves as cycling-wonderful -- not only is it good for tourism, if they want to get more of their own citizens cycling, one way to help it is through these this-is-what-we-are public proclamations. Marketing, the same thing that has so many people in the US convinced that Monster Trucks are part of our national identity, can also be used to get people onto bicycles. And Mikael takes great pictures. Is it possible that enough people cycling, reduced auto congestion, which over time led to people in cars choosing to drive more? I'm not talking about a day-by-day decision, but the kind that takes years to occur -- commuting in a car far into Copenhagen to work, becomes practical, because (at the moment) enough people ride bicycles that the auto congestion is reduced. Over time, more people might make that decision, and the roads would become re-congested with cars, and feel less safe to share. In the US, when a new major road is put through, it is often lovely at first, but over time people make job and home choices that use that lovely road, till it is full of cars and no longer lovely. If this (hare-brained) theory is correct, then indeed, it does matter to provide segregated facilities, that are unaffected by auto volumes, or else to remove/shrink auto facilities as the auto ride share goes down. Two minor disagreements: the Copenhagen bicycle paths are very wide, they are for one-way traffic, and there is one on each side of the street. I suspect the 2,2 metre number applies to a one-way bike path. Secondly, the lower score for subjective safety is largely dependent on the increase in cycling. Cyclists gave the width of the cycle path a 7/10 in 1996, this fell to 4 out of 10 in 2008. Unless the bike paths went on a diet, this reflects the larger number of cylists and possibly the larger number of cargo bikes. Source Cykelregnskab 2008 page 4. Interesting thoughts, I like it. I think the world should have different role models -- all towns are designed differently, are of different population, density etc. Things that work in one case might completely fail in another. Groningen is rather a small town compared (even Kopenhagen doesn't have many inhabitents) but the density is very low --> propably there's simply much more space for good bicycle infrastructure. However, I would love if we had bike lanes in Vienna that "are just two or 2.2 metres wide". Sometimes we don't even have that width for segregated cycle paths in both directions. Most bike lanes are only about 1-1.2 metres (zero meters gap to parked cars included). Generally cars always have priority over bikes and pedestrians. Thus I also believe that good infrastructure can make a huge difference. And I love to see many different approaches to that, including yours :). I like also the point about children (not) cycling to school. This used to be very common in Austria, but these days one can hardly see kids on bikes at all. Very hard to change peoples mind on that, although most parents have cycled to school themselves. For a Midwesterner USA, both Copenhagenized and Groningenized are pure dreams. In the St Louis region we just got done expanding a highway through the urban core with higher speed limits than before, the removal of homes and pedestrian bridges-walkways. Accessing dozens of stores, restaurants, etc. less than 1000 feet away on the other side of the highway requires traveling on eight lane roads over 3.5 miles roundtrip. Sad but true. Easy solutions to more traffic, more pollution and more noise are being prevented by transportation engineers who care more about paychecks than the public good. i wish we had these kinds of problems in chicago. I guess you are right about Copenhagen not being the bicycle capital of the world, but the difference between Copenhagen and fellow Scandinavian capitol Oslo where I commute by bike every day could not have been bigger. The bicycle path network is underdeveloped, but the worst part: Even the new "bicycle paths" being built are just a painted line on the side of the car lane or separate lanes that criss-cross the car road over bridges and through tunnels, making the physical distance travelled much longer. Anyway, keep up the good work with the inspiring blog on your view from the Dutch cycle path. Anna - Groningen has a population of 185,000 on 88 km2 --> density 2324/km2. Greater Copenhagen has a population of 1,9 million on 453 km2 --> density 5971/km2, whereas Vienna has a population of 1.6 million on 415 km2 --> density 4011/km2. Groningen's town centre is mediaeval, however, so very compact; it's hard to believe that those streets were once two-way traffic. It takes 20 minutes to cross, on foot. Providing space for cyclists is often just a matter of rearranging and redirecting traffic flows. The term Groningenize makes me smile. But you've forgotten one thing, David: How is this pronounced? You are highlighting a lot of the challenges that we have in Copenhagen. Regarding which specific measures to implement, Copenhagen is looking very much to Holland for inspiration and are happy to have such a good example to refer to. It is a positive development that there is competion for the honour of being the best city for cycling. And one could assume that the reason the Dutch Cyclist´ Unions magazine recently did a piece on Copenhagen, was to use the Copenhagen-example to motivate dutch authorities to continue to higher the standard. And with your article you are already paying back, your article gives us in Copenhagen further reason to improve cycling conditions even more, thank you. Great article! I just want to add a few words from Seattle perspective. I took a trip in September and October to cycle in Copenhagen, Amsterdam and Groningen. From my Northwest American perspective, I have to say they were all wonderful - and riding in Copenhagen rocked!. While I agree that the experience in Groningen did indeed feel a bit safer than the riding in Copenhagen and Amsterdam, compared to what I'm accustomed to out here in Seattle (or even Portland), any of those cities were great beyond imagining. We also cycled in the countryside around the three cities. Also great. If you ride a bike in the US you owe it to yourself to get to Holland and/or Denmark. It'll change your appreciation of what's possible and how excellent it is to get around by bike in a city that's been adapted for them. None of this is to say, of course, that differences you're pointing out don't matter in a European context. The numbers you're quoting suggest they do. But from over here, I think *any* of the above cities are fine models to learn from. In fact, giving the challenges we face, seeing as many different approaches and how they work is probably helpful. Bit of lateral thinking here, but.... could Copenhagen's declining cycling rate have anything to do with it's recently completed undergound metro? Been five years since I was last there, and the tube wasn't finished then, but surely that would account for some modal shift. On a related note, whilst Copenhagen always seemed to me the mecca of city cycling, having now lived in Berlin for a year, I truly believe it's Berlin. Mathew, read the post again. Copenhagen's cycling rate is not declining, it's increasing. What's declining is the proportion of people who feel safe on the bike paths. It's also notable that cyclists gave the width of the cycle path a 7/10 approval rating in 1996, this fell to 4 out of 10 in 2008. Unless the bike paths went on a diet, this reflects the larger number of cylists and possibly the larger number of cargo bikes. Source Cykelregnskab 2008 page 4. So Copenhagen is experiencing growing pains, not decline. I hadn't thought of the case of cargo bikes crowding things, but that is a definite possibility. Not only are they (we, actually -- I ride one usually) wider and heavier, once you have hauled heavy loads for a while you (well, I, at least) become much more tolerant of the occasional bump or scrape -- I've scraped bridge railings with my load, and rather than fall, I just adjust my balance and carry on. It's automatic, it happens before I have even figured out that I am scraping something and steer away from it. That would be unkind to another cyclist, if it were them, instead of a bridge railing. 25% av Copenhagen households with two or more children have a cargo bike or a trailer. Source Cykelregnskab 2008 page 14. So yes, I can see how people might react differently to cargo bikes, initially at least. @matthew: Regarding Berlin, can you please tell me you think it is a cycling mecca and presumably better than Copenhagen or anywhere in the NL? (I have also been here for about a year). Among other things, please let me know how cycling is for people not in your class/age/income/culture bracket. People ride their bikes when walking takes to long. Schools in Copenhagen are close to home so children walk. Adults work/study further away so they cycle. In the countryside children cycle everywhere because everything is further away. I directly asked for the overall bicycle share in Copenhagen, since I couldn't find any figure and here in Germany we mostly don't specify the commuting part but only the overall figures. So, this is what I learned from the KØBENHAVNS KOMMUNE, Teknik- og Miljøforvaltningen, Center for Trafik: "Vores bedste skøn er, at cyklisternes andel af den samlede trafik er 25 %." i.e. "Our best estimate of the overall traffic share of cyclists is 25%"
Thanks for an informative post. The spurious 40%, or 37%, mode share figure for Copenhagen is widely cited. I heard it in a talk by Hans Voerknecht of the Dutch Fietsberaad, a government agency, as he toured the USA in the fall of 2008. He should know better! The call for better bicycle facilities raises the question: what bicycle facilities are better? This issue becomes more pressing as diversity of human-powered vehicles increases. Apparently, wide and slow cargo trikes among today's improved, faster bicycles have upset planning in Copenhagen. Electrically-assisted bicycles are improving technically and becoming popular worldwide for people lacking strength or who want to avoid sweating in hot weather. Someday, streamlined velomobiles may be popular too. They are wide like cargo trikes, and fast. Any scheme which divides up the width of a street by vehicle type reduces capacity and increasingly limits speed to that of the slowest users. My favorite type of urban facility avoids these problems. It is the bicycle street, or bicycle boulevard, a quiet through street where barriers, diverters and traffic calming allow only slow, local motor traffic. The hazard of motor traffic after all results mostly from speed, not primarily from size and mass. Please see Berkeley, California, USA examples starting with this page. Copenhagen is one thing, and the whole Netherlands are another thing. How can one compare an urban cycle traffic system like Copenhagen with the cycle traffic of a whole country including small cities and countryside? Of course both is totally different. The hint to density is important, thanks to Frits B. Something important is that Copenhagen has always cycle infrastructure on both sides and never cycle path for both directions. The widths of cycle paths or cycle lanes is even up to 3.25 m or more, for example on the bridges from city core outside. In the Netherland cycle paths are very often only on one side for both directions. That constellation causes more accidents than bike pathes on both sides. Timeo Danes et dona ferentes? In reaction to your 2015 update on Danish cuts in the biking budget.. The Copenhagenize Index concluded that Copenhagen was no1 biking City before A'dam. I think A'dam scored higher on commute modal share, safety and bike ownership. Whereas Denmark scored higher on bike sales and advocacy groups (which less significant than the previous 3..). Al lws: Frankly, I'm surprised that anyone takes the Copenhagenize index seriously. The methodology is absurd (look it up - they're open enough to admit this) and it seems designed specifically not to tell the truth about anything - including about Copenhagen. It's merely a marketing tool. The product that is being sold is Copenhagenize. Neither Amsterdam nor Copenhagen are by any rational measure the "best" cycling city in the world. Amsterdam doesn't have the highest cycling modal share in the Netherlands, and it certainly isn't the most pleasant place to cycle in this country either. The latter is reflected in it being the Dutch city with the lowest cycling to school rate. When I first wrote this piece, Dutch sources of information could at least be counted upon to be reasonably factual. Sadly, that is no longer true and Dutch organisations seem to be competing with the Danes now to exaggerate as much as possible. This first happened in Amsterdam. Groningen and Utrecht also both now seem to be interested more in marketing than genuinely building better infrastructure. For those who want to see them, real stats are still out there. David, Indeed I was a rather suspicous on the Copenhagenize Index ( And this goes for indexes in general). But I was still surpised how bogus the criteria and the results were, when I look them up. Unfortunately it seems that it gets more attention in the news media than before.. So what does Copenhagen need in summary. A verge between cycle path and roadway, wider cycle tracks, protected intersections/simultaneous green (either is good, I imagine that in central Copenhagen, simultaneous green could be chosen quite a lot by the engineers who see the numbers of left turners justify the extra stage (To get such a junction, you need separate bicycle lights for each direction, a cycle track all the way to the stop line, a sign to indicate right turns are free, and that the intersection uses simultaneous green. It would be also good if thee was a countdown to green, and separate signal stages for motor traffic turning and those going straight), you will probably want to use coloured asphalt to mark out the cycleways. Red can be used well. Gateway treatments at minor side roads. Roundabouts with cycle paths not lanes, and more roundabouts so as to avoid traffic lights. Calming 30 km/h zones more, and making it more clear as to where the parking lane is, this optically narrows roads. Removing more cars from the 30 kmh zones too. More unraveling, and i think Copenhagen could very well and easily get towards its target, probably even more than its target. Probably the biggest problem plaguing Copenhagen cycle tracks is the intersections, signalized intersections in particular. They have a few roundabouts with cycle lanes. They could add a small curb between lane and car lanes, and while not ideal, it does provide more protection than paint, though a fully separate cycle track with something like 6 metres between cycle path and roadway can be built. More roundabouts could be built. Signalized intersections converted to use simultaneous green would actually be quite easy for Copenhagen. Have a cycle track on each approach that would be useful by bike (so you don't need cycle tracks from freeways), have a bicycle only signal, and rework the traffic lights, and introduce new laws allowing right on reds or actually any bicycle movement that if you can proceed without crossing an area in use by motor vehicles, then you can go past the stopping line. If it would lead to an area that used by cars, then a sign must be used (like turning into a 30 km/h zone). Copenhagen could also widen cycle tracks and put a verge between path and roadway, so that would improve the feeling of safety a lot. If you had grass in those verges, it would look a lot nicer. Minor side streets without cycle infrastructure could have something a bit like this for the collector roads:https://www.google.ca/maps/@52.1239422,5.109414,3a,75y,341.57h,73.56t/data=!3m6!1e1!3m4!1s3A3922fObWndjaDtgf4dpw!2e0!7i13312!8i6656, it could cut down motor vehicle volumes with some closures in some areas, because even at 30 km/h a bunch of cars still scares people. Shared Space proves that. Adding more green time for bicycles, more shortcuts and diverting motor traffic around so journeys can have fewer give ways, fewer traffic lights and more roundabouts, more shortcuts and fewer cars to deal with. It really would make a 40% modal share plausible. Parts of Copenhagen are extremely carcentric. You have three lanes of traffic in each direction. What they did in Amsterdam is get rid of a lane of traffic and use it to widen the sidewalk, add a separate cycle lane and a line of trees. (Check Wibautstraat in Google Maps, for example). Doesn't seem to be the appetite in Copenhagen to sacrifice those extra car lanes. Walk down Stormgade in Copenhagen or get off the Metro at Kongens Nytorv and you really get the feeling that you are in a city built for cars only. The comments about Wibautstraat in Amsterdam versus Stormgade in Copenhagen are disingenious and a highly selective and manipulated comparison. Kongens Nytorv is another highly irregular example as two thirds of the square is at present a huge metro station excavation site meaning that the available space is limited and since Copenhagen does not have a proper eastern ring road due to the harbour canal Kongens Nytorv unfortunately has to be used for this purpose.